SATgourmet: Cook Your Way Through The S.A.T. 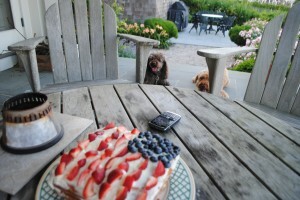 Diego and Jorge, Tastetesters-In-Waiting, love Fourth of July Cakes. Most people look forward to the Fourth of July for its fireworks and cookouts, but I look forward to the very traditional and very delicious, Fourth of July Cake that many Americans make. This AESTHETIC MASTERPIECE is ADORNED with strawberries, blueberries and cream cheese frosting and ends up looking like an American flag. Very patriotic! Ingredients: 2 sticks unsalted, room temperature butter, 1 cup white sugar, 3 eggs, 2 cups all-purpose white flour, 1 tsp baking soda, 2 tsp baking powder, 1 tsp salt, 1 cup sour cream, 2 tbsp vanilla extract. 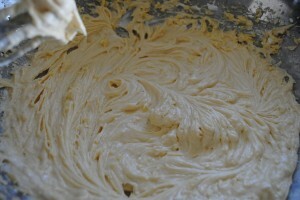 Begin by preheating an oven to 350ºF and butter and flour a 9x13x2″ cake pan. 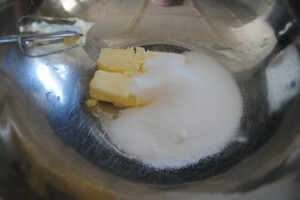 In a large bowl, cream together the butter and sugar using an electric mixer. 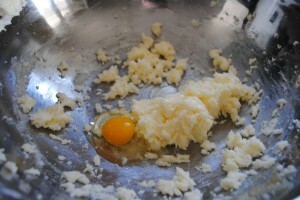 Add the eggs one at a time and mix together until smooth. 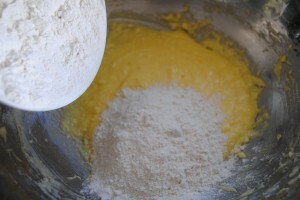 Add the flour in increments and mix. 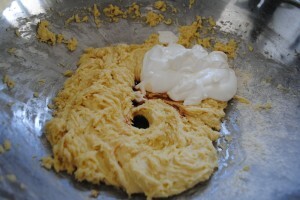 Add the vanilla and sour cream and mix until just combined. Pour the batter into the prepared pan, smooth over the top and bake for about 45-50 minutes or until golden brown and toothpick inserted comes out clean. 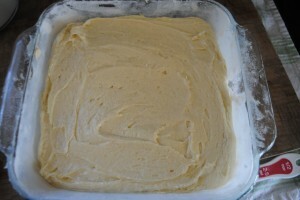 Cool in pan, remove and cut the cake in 1/2 lengthwise. For the frosting, I mixed together 8 oz room temperature cream cheese, 1/2 stick (4 tbsp) softened butter and 1/2 cup of powdered sugar. Frost the middle, top and outside of the cake until covered. 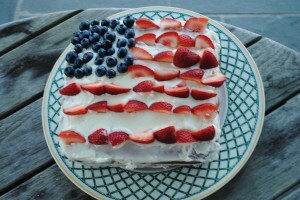 Decorate with blueberries and strawberries to create the design of an American flag. The finished product. 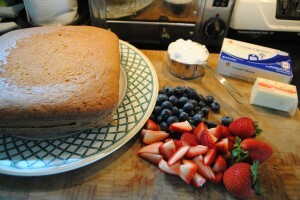 This cake is open to creativity and the number of blueberries and strawberries doesn’t so much matter. Have fun with it! 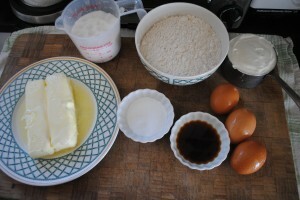 This entry was posted in Dessert, Fourth of July, Holidays, Recipes, Vocabulary. Bookmark the permalink.